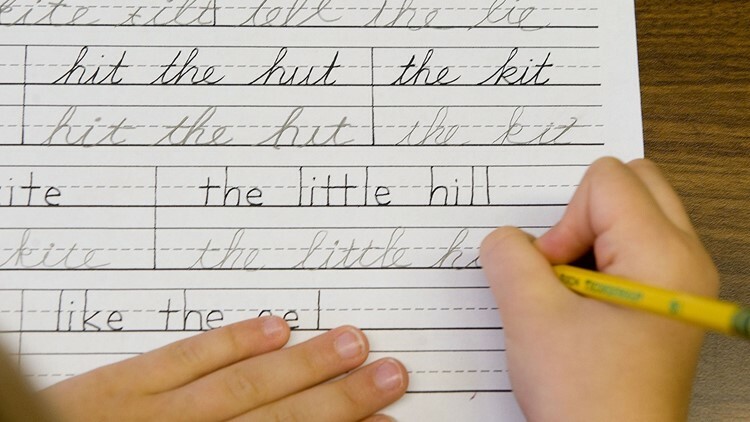 Many schools across the country have stopped teaching cursive handwriting. But one Maine lawmaker wants to stop the trend. AUGUSTA, Maine — Cursive handwriting, also known as script, has existed since written language's inception millenniums ago, used mainly to quicken speed but also to improve penmanship aesthetics. Its usage has considerably dropped in the 21st century with the advent of several alternative writing methods, notably computers, and has essentially been reduced to the signature. Many schools have stopped teaching cursive handwriting. But one Maine lawmaker wants to halt the trend by requiring it be instructed in classrooms. A bill introduced to the Maine Legislature would do just that — order the state Education Department to implement curriculum introducing students to the technique in third grade and necessitate competence by fifth grade. L.D. 387, "An Act To Require Cursive Handwriting Instruction in Grade 3 to Grade 5," was presented late last month by state Rep. Heidi Sampson, R-Alfred, and was heard Thursday in committee. According to the legislation, the measure would enact, "beginning July 1, 2020, the parameters for essential instruction and graduation requirements adopted by the department pursuant to section 6209 for English language arts must provide for continual, regular instruction of and opportunities to use cursive handwriting beginning no later than grade 3 and continuing to the end of grade 5. The instruction must be designed to enable students to demonstrate competency in cursive handwriting by the end of grade 5." A day prior to the bill's official submission date, Rep. Sampson posted a poll on her Facebook page asking whether elementary schools should teach cursive handwriting — the response was 94 percent "Yes," 6 percent "No." Co-sponsors of the measure include Sens. Justin Chenette, D-York, and David Woodsome, R-York; and Reps. Josanne Dolloff, R-Rumford, Chad Grignon, R-Athens, and James Handy, D-Lewiston. The bill faces more action in committee and votes before both legislative chambers. Stay up to date on proceedings here.